One of the snacks which uniquely every person in Kerala likes is the banana chips. There is no “Sadya” (festive feast) without them. There is no Onam, Vishu or wedding celebrations without them. Every malayali goes out Kerala carrying at least one pack of Banana chips or plantain chips .They are as addictive as potato chips. The other chips I was fond of during my child hood are jackfruit chips. My grandmother used to make big containers of jack fruit chips during my summer holidays. Here in US Jack fruit costs all almost like gold. So I usually am looking at them in store just window shopping, thinking of all possible dishes I can make with a piece of it. Luckily, plantains are not costly as jack fruit so I buy them frequently. When they’re not ripe and green I have an itch to make chips with them. I know it is time taking process but the end results are always worth the efforts. 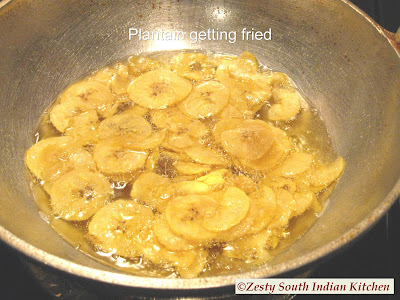 If plantains are ripe (yellowish with lot of dark black spots) we like to eat as such or I will make ethakaa appam (recipe follows). 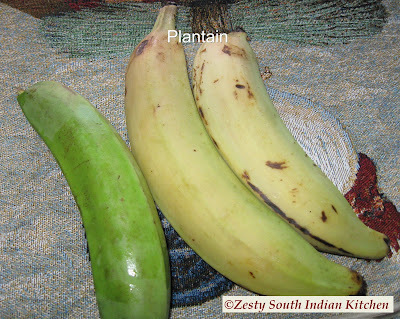 Plantains taste differently from ordinary banana available in the market. They are starchier like potato. Mom rarely used to make these chips at home as it is easily available in bakeries or even mobile stall where they fry chips and sell them. Banana chips available in US stores are just a sweetened version and I am not a fan of that. I like raw banana chips. 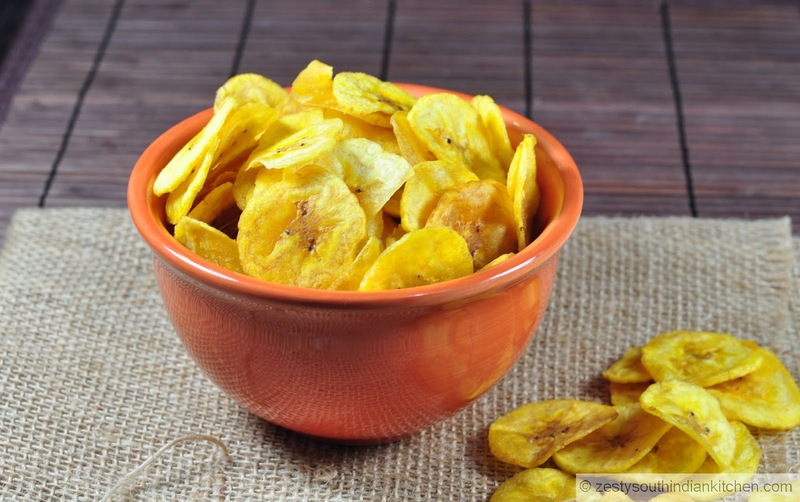 There are couple of ways you can make banana chips such as directly frying in oil or a healthy version of baking with a small amount of oil (I will try this method later). I made banana chips this way. In a sauce pot add water and turmeric and keep aside. 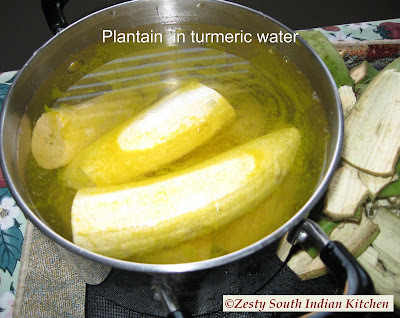 Peel plantain skin (you will see white flesh) and put in the water for 30 minutes. 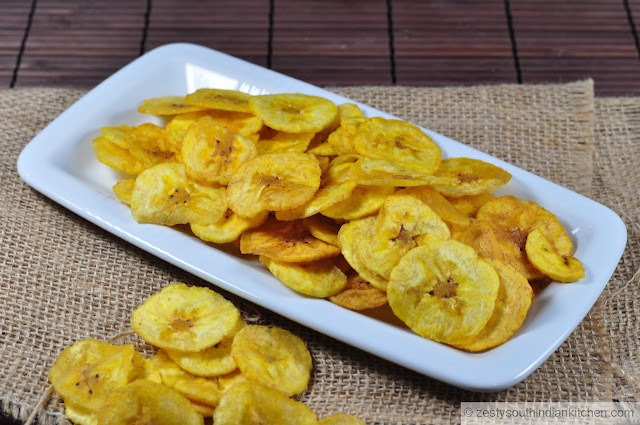 This will remove the stickiness of plantain and will be easy to slice them and preserve the color and also prevent them from sticking while frying. 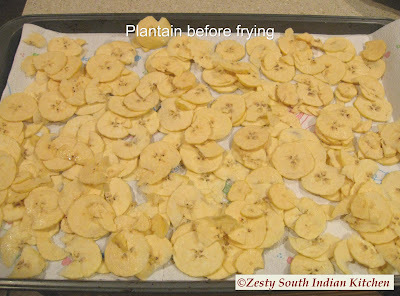 Slice the plantain into round or oval of 1/8 inch thickness using a mandoline. Dry the sliced pieces in baking sheet lined with kitchen tissue or towel. Heat the oil in a deep pot until they are hot (not smoking). Fry the pieces in the hot oil without overcrowding them. Occasionally give stir to flip them and keep them from sticking together. Once they are ¾ done (around 5 minutes or you will hear sizzling sound while turning them) add 1 teaspoon of salt water and close the pot with a lid (this will prevent splashing, be careful with this method, if you are not comfortable you can add salt later) and remove the lid a minute or two later to check if the splashing has stopped. Fry for another 2 minutes or until golden brown and remove them with a slotted spoon into plate lined with paper towels for draining the excess oil. Next batch reduce the salt content as salt is already present in the oil. Continue until you finish frying all plantains. If you are not using the salt water, season with salt once you removed from the oil. Enjoy these chips with hot tea or coffee. Will you make it again: More often as long as I can get raw plantains. They look lovely Swati.They definitely are addictive:).First time to ur blog,u have a nice one out here. Add some ginger to that! I fried banana chips using your recipe, and they turned out so good! This is the first time I have tried to make them at home. I love these chips! Thank you for teaching us step by step, showing photos at every stage. That helped a lot! Glad you like it Gracie. I am happy the my post helped you to make this delicious chips.